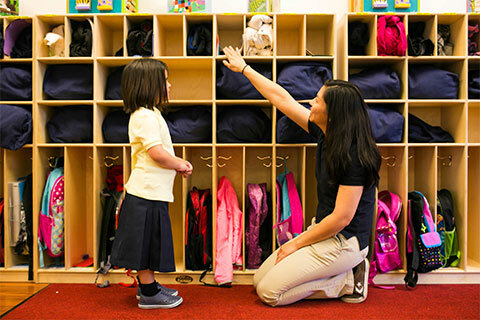 Adjusting to preschool can be tough for any child, even one who’s been in daycare for a while. You can help ease your child’s transition to preschool with these ideas and activities.The important thing is to keep any preparation time fun. At this age, learning should not be a chore. You don’t want your child to feel like every activity is a lesson or every outing an educational field trip. If your child hasn’t spent much time in a group with other children, then activities such as sharing, taking turns, and playing cooperatively can be very difficult. Help your child get used to being part of a group by arranging play dates with one or two peers or enrolling him/her in a music or tumbling class. It’s usual for some children to get a little anxious about starting preschool. Resist the temptation to say things like “It’ll be the most fun you’ve ever had,” or “There’s nothing to be afraid of,” and never belittle your child’s fears or concerns. Instead, help calm their fears with information. Talk to them about what to expect when they get to school — where they’ll be going, what they’ll be doing, and who will be in class with them. Before school begins, visit the classroom together at least once, preferably when other children and their future teacher(s) are there. You can also read stories about starting school. Some good ones to try are “Going to School”, by Anne Civardi and Stephen Cartwright, “Preschool Day Hooray!” By Linda Leopold Strauss, and “Maisy Goes to Preschool” by Lucy Cousins. If this is the first time your child will be away from you, they may worry that you’re not coming back, or that you’ll get lost and won’t be able to find your way back to the school to pick them up at the end of the day. Invent a special parting ritual — such as a high-five, or saying something like, “I’ll be back to get you soon, long before we see the moon” — that you do each time you drop them off. During the first few days, allow extra time to get them ready and out the door in the morning, too. The more calm, things are at home, the easier the separation will be. Although you might be tempted to sneak out without somuch as a wave when you drop them off, don’t do it. They will only be more distressed when they realize you’re gone. Instead, make a it a point to say good-bye. Don’t drag it out or let on that you might be upset. Just do it matter-of-factly and confidently and they’ll learn to do the same.